January brings one of the most exciting times of the Stampin' Up! year. 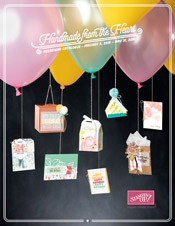 Starting January 5th, we launch our Occasions Catalog and the start of Sale-A-Bration. It's Stampin Up! 's hostess and customer appreciation promotion and with every $50 purchase, you can choose a free product from the Sale-A-Bration catalog! No limit, a $100 order gets 2 FREE products, $150 order gets 3 FREE products and on and on! This year we have 7 Stamp Sets, Designer Series Paper, Specialty Designer Series Paper, a Vellum Stack of 6 x 6 papers and a Project Life Specialty Card Collection! 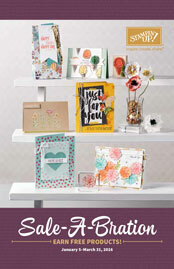 The Occasions Catalog is full of Valentine's, spring stamp sets and florals plus fun new embellishments and all new Designer Series Paper. While we wait, I have a couple of sneak peek samples to show you. These cards use the new Limited Time HELLO stamp set that is FREE with a $50 purchase from the Sale-A-Bration catalog and the new Birthday Blooms stamp set from the Occasions Catalog. I love using the words as a background! I stamped the flowers on the card and then an extra to cut out and layer on top of the image with Stampin' Dimensionals. I colored them with ink from the stamp pads and Blender Pens. Beautiful card Becky! Never thought to use the words as a background. Happy New Year!